I’m Kalesha, I’m 22 years old and I’ve been volunteering at the 8th Paisley for seven years. Why do you volunteer as a BB leader? I volunteer because I have so much fun every week! I originally joined to fulfil the volunteering section of the Duke of Edinburgh’s Award, and I was hooked! The B.B. has given me so much in terms of opportunities, friendships and skills, and I am keen to ensure the next generation receives the same. What do you think has been your biggest achievement in the BB? 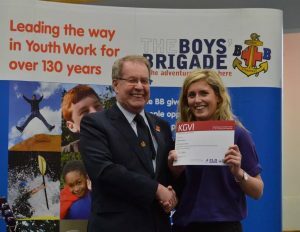 I was the very first person from the 8th Paisley to ever undertake the KGVI Youth Leader Training. This qualification has definitely provided a talking point on my CV, and it has now started a chain reaction with more young leaders coming through my company and through KGVI. What female role model inspires you? I am inspired by Amelia Earhart, who was the first female to fly solo across the Atlantic. Amelia wasn’t afraid to be herself and achieve her aspirations in a male dominated world, and I think that her story is still very relevant today. How do think your volunteering influences others - particularly young women? I think my volunteering influences the boys in my company, and shows them what can be achieved through the B.B.. I’ve been to Downing Street in London, had dinner with the Moderator of the Church of Scotland, been broadcast on the radio, and visited Bangladesh through the World Mission Fund. I would like to think that this shows the boys the opportunities that can be had within the B.B. Through my involvement in the Battalion’s Seniors and Young Leaders Committee I have met several of the young women volunteering in Paisley and District, and I think we all motivate each other. I think this shows that young women are welcomed and valued in the B.B. You can learn more about volunteering with The Boys' Brigade here.